Building on an above-average vintage like 2012, both in terms of yield and overall wine quality, 2013 was exceptional from the early stages of the growing season right through the pick date in mid October. Yields were similar to 2012, but in 2013 one of the real defining characteristics that took wine quality to the next level was clusters that were similar in size to what we saw in the prior vintage, but with smaller berries. That translated to a higher skin to juice ratio for the fermentations, creating wines of intense depth, structure, and phenological maturity. 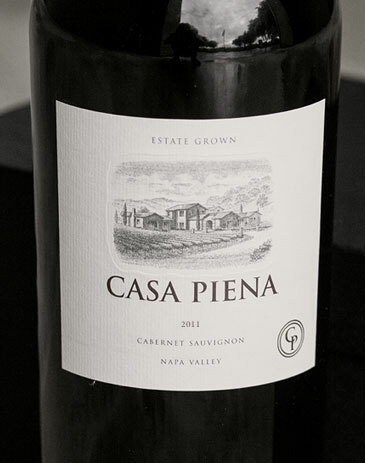 The 2013 Casa Piena Estate Cabernet Sauvignon is made up of the best barrels of clones 337, 341 and clone 7. In the glass the wine has a nearly opaque deep purple hue. The real intrigue comes in the form of the nuanced, deeply layered aromatics. Notes both light and dark emanate towards you: citrus peel, lavender, star anise, cedar bark, crushed blackberries, sandalwood and kirsch liqueur. The palate experience is definitively marked by a pronounced structure and bright high tones, which is the calling card for a wine that had plenty of skin contact during fermentation. Dark notes of cassis, baking chocolate, plum compote, tobacco leaf and oolong tea are neatly layered amidst an upright and bright acid backbone. Casa Piena is drinking beautifully now. However, 7+ years in the cellar will allow these wines to age extremely graciously plus show their true colors once all the structural components integrate and flesh out. After 18 months in the cellar, the finished wine has a deep opaque color with a complementary violet edge in the glass. Layered notes of kirsch liqueur, rosemary, and nutmeg are found on the nose. The palate experience offers both structure and a complex fruit core that play off each other. The entry has a refined earthiness that evolves into a softer, rounder mid-palate dominated by spicy fruit notes. The finish is marked by a nice acid balance and long, 30 second reminder of what a strong vintage, smart farming and intuitive winemaking can achieve. This wine expresses itself as a classic Cabernet Sauvignon that shows equal parts fruit and soil. With 5-7 years in the cellar it will evolve beautifully and offer delicate nuance over an even longer period. This wine is the result of the synthesis of our winemaking goals and the detailed care and attention paid to all aspects of the farming program. We work intimately with the Barbour Vineyard’s team to come up with a precise farming regimen to accommodate each variable and maximize the potential of the site with the ultimate goal being vine uniformity. This is achieved through utilizing different cover crops in different blocks as well as cultural practices such as leaf-thinning for canopy management and fruit thinning to ward off bunch rot and establish phenological maturity. The most influential variable for 2011 was of course the climate. When you’re working with a challenging year, creative and effective farming practices are paramount to overall success. We couldn’t be happier with the end result of this wine in the glass. It embodies all the character of the site and delivers a rich, complex and complete Cabernet that once again balances all the fruit and savory notes the estate has become famous for. Most people only have one breakout vintage, we’ve been lucky enough to have two. The 2010 represents a giant leap forward qualitatively for Casa Piena. Dialing in the perfect yield for the season while reacting early to the cool summer conditions allowed us to achieve true ripeness in a challenging year. The vintage valley wide is framed by acidity and that only adds to the traditional elegance of the Casa Piena site. The best wines from the property feature balance in several areas: fruit vs. tannin vs. acidity, savory vs. fruity elements, palate depth vs. breadth and palate weight/power vs. some of the more ethereal elements that contribute complexity to great wines. Every year what dictates this achievement changes. The Casa Piena wines have always been driven by the site and this might be the purest expression yet. Never have we seen the importance of the quality of a vineyard’s dirt come into play more than in 2009. We got off to a great start with a dry, warm spring and very little frost to speak of. A larger than average crop insured proper hang time in a warmer than average year. The six inches of rain that fell around October 12th we weren’t prepared for. Here’s where the property bailed us out. We missed maybe a week’s ripening progress as the site dried out seeing no mold or mildew growth on the fruit or any increase in berry size. As sunnier conditions returned we hung everything out for a couple more weeks bringing in the entire estate from October 24th-28th. The 2009 continues the elevated quality level we saw with the 2008. It’s once more an elegant styled wine being more medium bodied and full of red and black fruits. The nose features rose petals, licorice, sweet tobacco, melted chocolate and blackcurrants. The balance between fruit and soil driven elements continues on the palate with a nice mix of cassis, pain grille, sandalwood, crushed blackberries and blueberries. The third crop is the charm. We’ve been saying it now for a few years emphasizing the growing pains associated with a young vineyard. The first two years can be kind of a mixed bag with both wines being solid but ever changing in barrel and bottle. With this third year, the 2008, we saw good stability of color and flavor and a wine that got steadily better as it aged. Coming from a vintage that still unjustly sits in the afterglow of 2007, the 2008 Casa Piena will surprise a lot of people both as a wine that surpasses anything we’ve ever done before and as the beginning of a high-quality trajectory for this young estate vineyard. The elegance that defines Casa Piena is certainly evident in the 2007 vintage, but it also contains a concentrated fruit quality that we weren’t sure was possible from this area. The fruit is darker in profile than the 2006, more purple/black than red/black, and much deeper at this point in the wine’s evolution. The soil driven elements are present but are masked by the layers of blueberries, blackberries and melted chocolate that the year gave us. This wine feels rounder than its predecessor and has in common with other great wines what we think sets them all apart, the ability to drink great young, middle-aged and old aged. We knew early on 2007 was something special and now here’s the realization of that first thought. The aroma of the wine greets you before your nose even makes it to the glass. Scents of rose petals, licorice, sweet tobacco leaf and blue and purple fruits mark the effusive nose. The vineyard’s location on the Silverado Trail side of Yountville gives the wine a more elegant palate filled with notes of melted chocolate, espresso roast, lavender, creosote and complemented by a rich minerality that provides backbone and structure. The tannins are evident early with the wine providing a firmer experience than we believed the site would suggest. This wine definitely drinks better after an hour or so in decanter and is in no danger of fading for a decade in the cellar. With such an abundance of quality lots made from the Casa Piena Estate in 2013 it was a tough decision regarding which lots went into the Our Gang bottling. At the core of this program, our philosophy has always been to craft a wine that is approachable early on, while still offering mouth-watering freshness and complexity. This wine was made to be enjoyed among those you share your life with, your gang, and we hope you appreciate it as much as we had the pleasure of watching it develop into the exceptional Cabernet Sauvignon it represents today. The 2013 wines are noted for their complexity and this wine does not stray from that marker. In the glass the wine displays an opaque dark rose hue with a light purple halo. The aromas that emerge from the wine possess a bright, energetic quality reminiscent of lavender, cinnamon, rosemary and raspberry compote. The palate experience has a very smooth, even keel to it with a fine tannin framework. Notes of black cherry, cocoa nib, cigar wrapper and flint are all wrapped up in a structured fruit-focused package. This wine is ready to be enjoyed now or set aside for a special occasion in the near future. This is an easy wine to love both in practice and in theory. The name itself is inclusive and about bringing people together under an umbrella of shared fondness. It’s about family and enjoying time together over food and wine. Integrated notes of spiced plum, anise, and aromatic wood emanate from the glass. The mouth feel of this wine has a very sleek, refined trajectory with complementary notes of black raspberry, dark chocolate, graphite and pomegranate interacting seamlessly across the palate. The tannins are so fine on this wine that while they exist, they do not behave in a blockish manner. Each year we spend a lot of time considering which estate blocks will go into the Our Gang bottling. This wine is made to embody all the essential characteristics of the Estate Vineyard and be approachable immediately upon release. Created through block-by-block analysis and blending trials, the 2011 Our Gang has the hallmark acid backbone and light tannic frame that reminds us of the OG bottlings of the past. The vintage-contributed spicy red fruit notes round everything out in the glass and deliver a lengthy, plush finish. Only 124 cases produced of this 100% Estate Cabernet, this wine is a must have addition to your collection of Casa Piena wines. Harvest date was October 20th, 2010 for all lots. Thomas has loved the '10s since they were bottled and has remarked that they never really went into bottle shock. While the wine is drinking wonderfully right now, he is projecting that the Our Gang has the potential to peak in 10-15 years.Thomas is always hesitant to call the Our Gang our "second label" as the fruit profile and structure of the wine competes with most of the leading Cabernets from the area. This wine offers another look into the complexity and uniqueness of our Yountville Estate. True to the overall characteristics of the 2010 vintage, this wine is layered with soft, lush red fruit, chocolate, sweet tobacco and baking spices. The tannin structure is readily present but finishes with length and elegance. As typical for our property the wine shows a great backbone of acidity lending it the opportunity to pair with all different cuisines. A vintage like 2009 really reminded us of what grows best at the estate. Given our 5 day picking window all the blocks from the estate came into the winery with similar levels of ripeness and tonnage per acre numbers. When we finally sat down to blend in February 2011 what separated the wines had more to do with inherent style than overt qualitative differences. We recognized this was a nice problem to have but finding the answer required a few additional tastings throughout the month. Eventually the wines were divided across accessibility and fruit profile spectrums. The softer, redder fruited wines are what ultimately came to comprise this edition of Our Gang. We felt people would want to drink the second wine before the flagship bottling so it was blended to drink well young. The profile is classic California Cabernet: red currants, menthol, sweet tobacco and graphite. As good as this wine is, I almost hesitate to call it a second wine.